Yesterday my friend Beth took me to Economy Candy in Manhattan. I don't know how I have lived in New York for 8 years and had never visited before. It was amazing! There was candy up to the - very high, pressed tin - ceiling! There was candy by the pound! There was imported candy! Old fashioned candy! Candy I had never seen before! 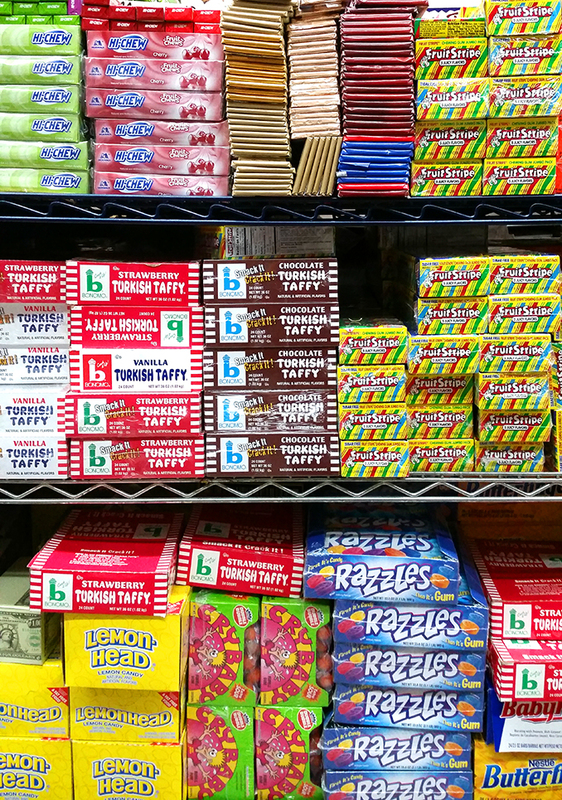 This is a place with so much candy that it supplies other bulk, by-the-pound candy shops. While we were there, someone bought three 5 pound Hershey's chocolate bars! It was inspiring, to say the least. This is the 99¢ table. This is just a small corner. There was a huge variety of candy bars & sweets. Every kind of candy is sorted by color, flavor, or wrapper. Many candies can be bought in smaller amounts, but some are only available in bulk quantities. These are gumballs and peppermints that were only available for wholesale accounts. Candy is stacked to the ceiling! It is a little chaotic in the shop, but you can find anything you are looking for pretty easily. You can buy a whole box if you have a crazy sweet tooth.